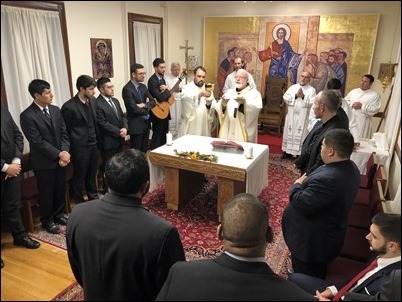 Saturday I went to our Redemptoris Mater Seminary in Brookline to celebrate the Rite of Candidacy of two seminarians. 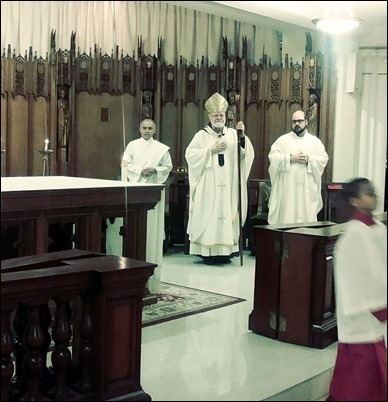 We celebrated the Vigil Mass of Christ the King at which Eric Gonzalez and Fernando Vivas were admitted to candidacy. 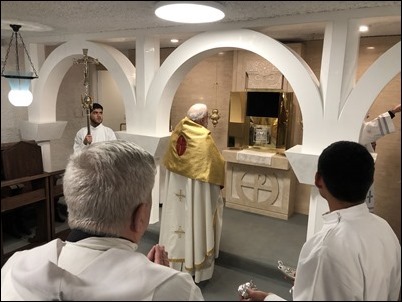 At the conclusion of the Mass, we carried the Blessed Sacrament to the new sanctuary of the word, which we then blessed. 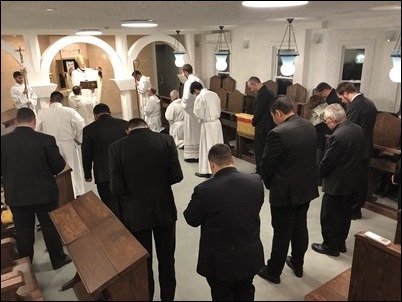 It is a beautiful chapel with the Sacrament in reserve, but also a place where the seminarians spend time in prayer and reflection on the Scriptures. 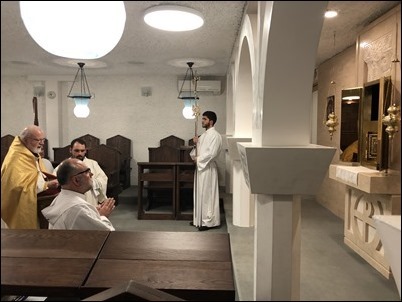 The seminarians themselves made the pews for the chapel. I was very pleased with how the chapel turned out. It really is stunning. Sunday morning, I celebrated Mass for the Feast of Christ the King for the Spanish community at the Cathedral of the Holy Cross. 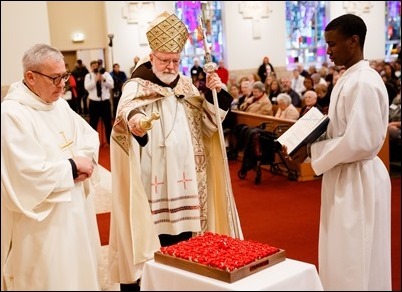 There, we also marked Father Pablo Gomez’s birthday. 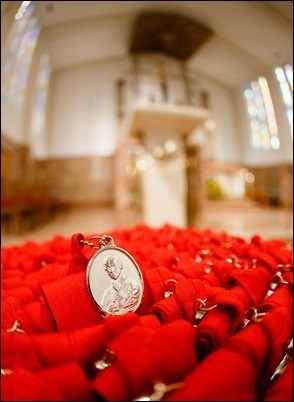 Sunday, I went to Immaculate Conception Church in Malden for the presentation of our annual Cheverus Award Medals. 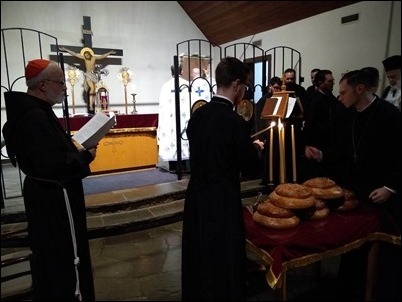 Traditionally, the celebration is held in the Cathedral but, because the Cathedral is still undergoing renovations, we moved it to Malden this year. 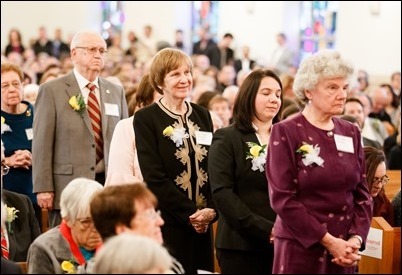 We initiated the Cheverus Award in 2008, the archdiocese’s bicentennial year, as a way to recognize the unsung heroes and heroines of our parishes and ministries and publicly thank them on behalf of the whole Catholic community. 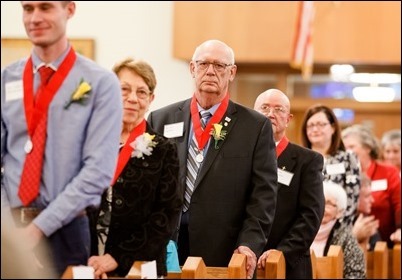 This year, we presented 125 people with the Cheverus Medal. 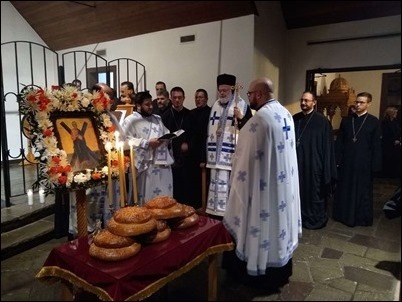 We were particularly happy that we were able to hold the ceremony on the very Feast of Christ the King, which was also Thanksgiving weekend. 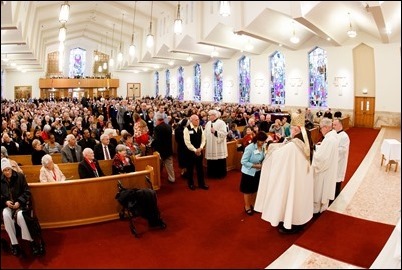 In my homily, I said that this was an occasion to give thanks to God for these brothers and sisters and their generous service to the Church. 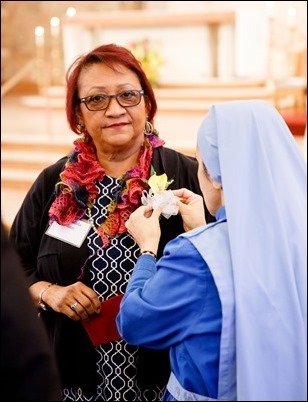 I also spoke about the fact that it was the Feast of Christ the King, and that we extend Christ’s kingdom by the witness of our lives and that the awardees are people who have given a great witness through their faith and generosity. 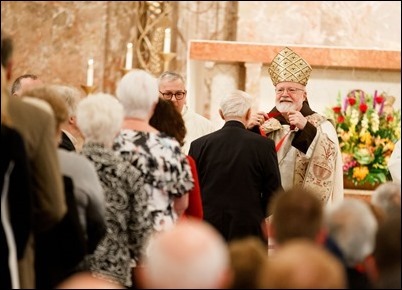 Some have given many, many decades of service to the Church, and their deep commitment and hard work have been the motor force that keeps our parishes and ministries running. 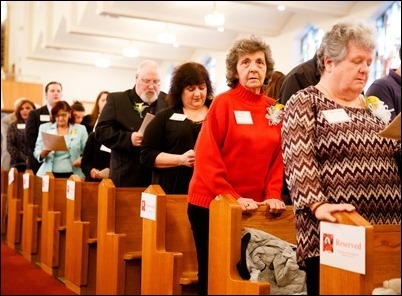 So, this was such a wonderful opportunity to say thank you to God and thank you to them. 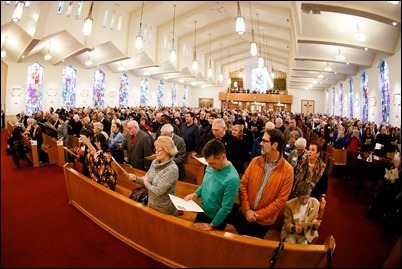 It is always very uplifting to see the enthusiasm of our Catholic community for the celebration. 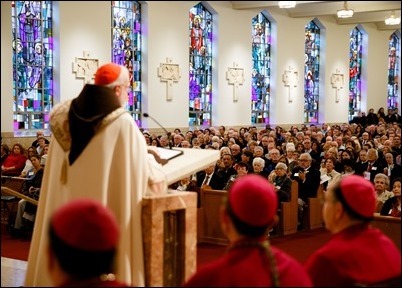 In addition to the relatives and friends of the honorees, people come together from all the parishes to accompany them on this very important occasion for the Church, in which we celebrate the gifts and the talents of our people who generously put those gifts at the service of God and Church. 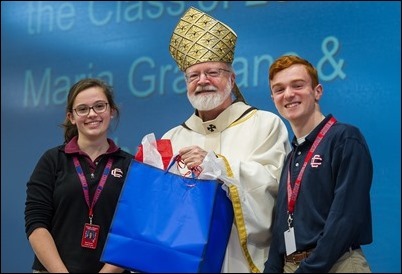 Monday, I went to Central Catholic High School in Lawrence for a Mass with the school community. The high school is flourishing. 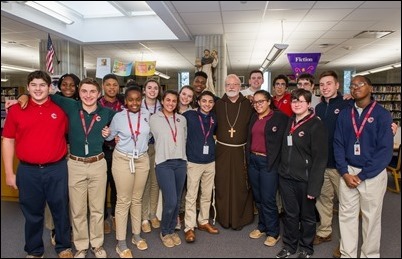 We are so grateful to the Marist Brothers for the wonderful job that they have done there, and their Marist charism is still very much part of the school. 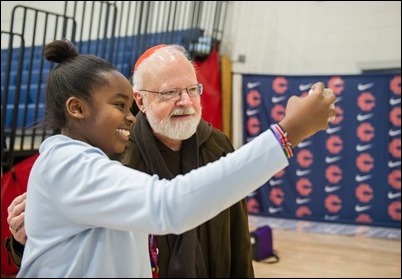 We are also so grateful for Central Catholic’s president¸ Christopher Sullivan, and their principal, Doreen Keller, for the fine leadership they give. We celebrated Mass in the gymnasium. 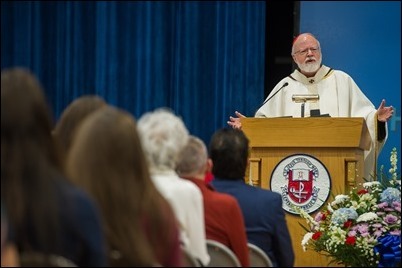 It was a Mass of the Holy Spirit, which we celebrate to open the school year, but there was also the theme of Thanksgiving for the gift of Catholic education. At the end of Mass, they presented me with some lovely gifts. 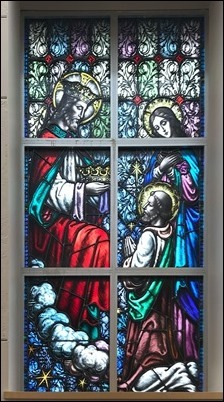 While I was at Central Catholic, I was intrigued by this very unusual stained-glass window in the chapel. It depicts the Crowning of St. Joseph. I had never seen something like that before, but am told it is an image sometimes used in French churches. 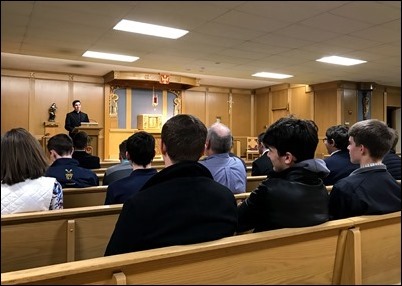 Tuesday, we had one of our periodic St. Andrew Dinners for young men considering a vocation to the priesthood. 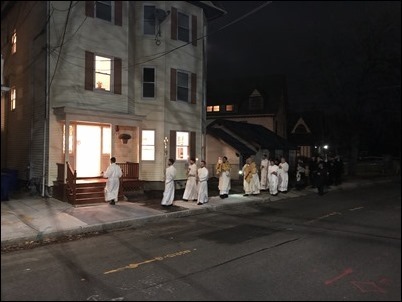 It was held at Sacred Heart Church in Watertown, where Father Kevin Sepe is the pastor and Father Matt Conley is the vicar. This time, we had a very good group of about 50 young men join us. 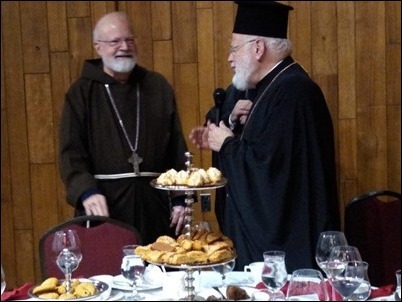 As we typically do, we began our gathering with Evening Prayer and dinner, followed by a time of conversation. 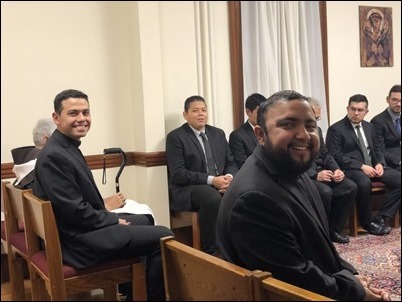 Three of our seminarians — David Campo, Paul Born and Peter Schirripa — gave a witness talks about their vocations. Then I addressed the group. 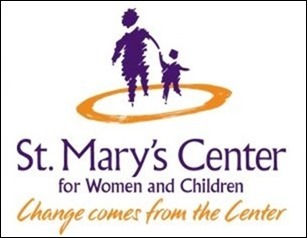 Wednesday, I attended a reception sponsored by St. Mary’s Center for Women and Children to honor recently retired Boston Police Commissioner William Evans. It was an occasion to express their gratitude for his service as police commissioner and his support of St. Mary’s Center. 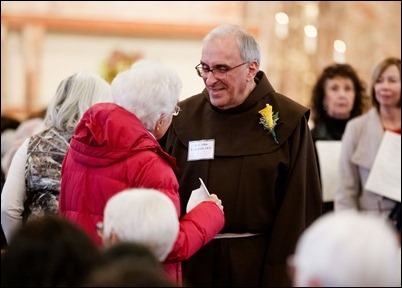 He has always been a very strong supporter of St. Mary’s Center and recently been named to the board. The event was co-chaired by Mayor Walsh and Lorrie Higgins and was held to benefit St. Mary’s new Community Resource Center. There were many officials from the state legislature as well as the City of Boston and the Boston Police Department with us to honor the former commissioner. A number of people spoke about his work on behalf of the people of the City of Boston as police commissioner, including Rev. Mark Scott of the Azusa Christian community. They noted that he always tried to be very present in our communities and promote good relationships between law enforcement and the local community. 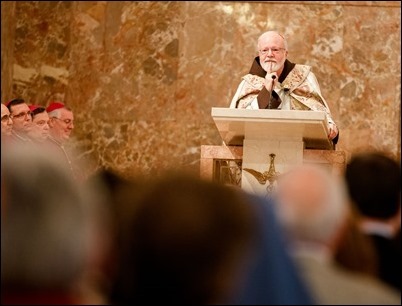 They also spoke about how he was always very present to people in times of crisis. 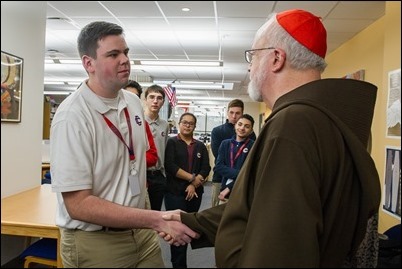 There is great admiration for his integrity and spirit of service, and everyone wished him well in his new position at Boston College. Mayor Walsh quipped that he was going to “that crime-ridden university” — but I am sure that it will be a much less demanding task for him and I know that he is very happy to be working at Boston College. 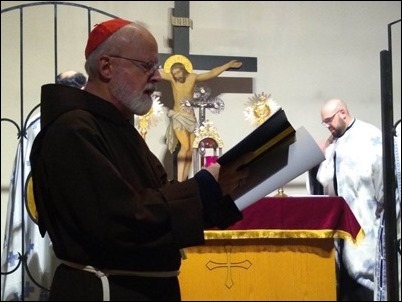 He has always given a wonderful testimony of his own Catholic formation and upbringing as being very important contributors to his life of service. So, I was very happy to be a part of this evening to honor him. 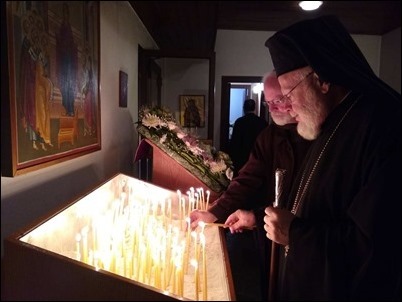 Finally, yesterday evening, I went to the Greek Orthodox Metropolis in Brookline to join in their celebration of the Feast of St. Andrew. 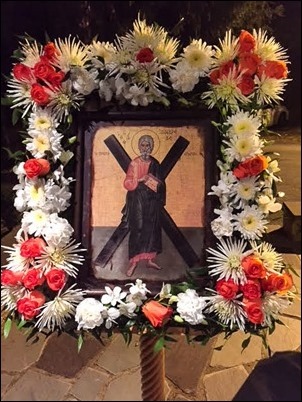 St. Andrew is the patron of the Eastern Church just as St. Peter is the patron of Rome. 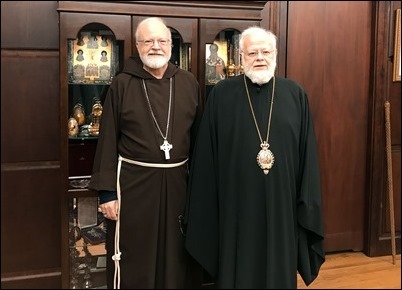 In a very significant practice that was initiated by St. Pope John Paul II, the Holy Father and Ecumenical Patriarch in Constantinople exchange delegations for the Feast of St. Andrew and the Feast of St. Peter, who were brothers. So, in that same spirit of fraternity, we have continued that tradition here locally. Afterwards, there was a lovely reception. I presented the Metropolitan with a print depicting the Last Supper which comes from the 15th-century missal that is housed in the Vatican library.